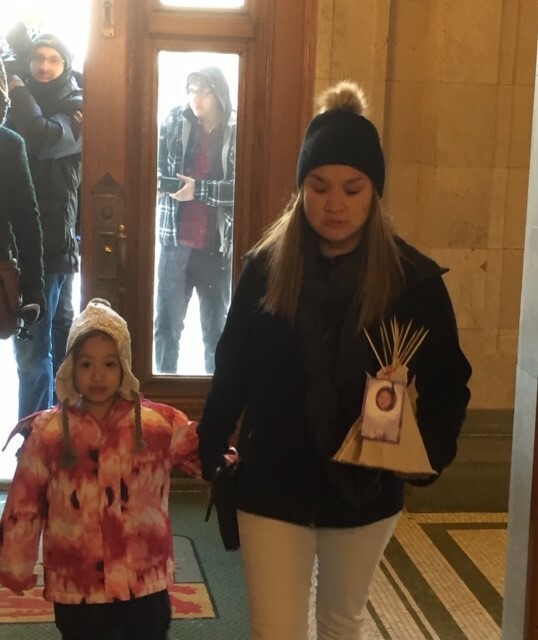 The family of Nadine Machiskinic say they are disappointed that justice was not served in her death following a meeting Tuesday with Regina Police Chief Evan Bray. Bray met to discuss the findings and recommendations from an RCMP review into the 29-year-old’s January 2015 death. Nadine’s aunt, Deloris Stevenson says Bray did not release the findings in the report, leaving her with questions with no answers. She and the Justice for Our Stolen Children protest group delivered a teepee with Machiskinic’s photo attached. Stevenson says the teepee was for Attorney General Don Morgan. A spokesperson for Chief Bray said in a statement that he wasn’t prepared to discuss the RCMP review report Wednesday and that a press conference would be called at a later date. “For over two years to get this response, I had an emotional conversation on my part, a part from the case and being able to heal and let go from that sense,” Stevenson said. Stevenson says she has done everything she can to advocate for her niece since the death. Machiskinic was found at the bottom of a laundry chute off the Delta Hotel in Regina in January 2015, with the death ultimately ruled as undetermined by an inquest jury.